I went to a talent ID camp at the Olympic Training Center in Colorado Springs as a junior and we were riding with different pros every day. Before then, I don’t think I understood that racing my bike could be a profession so when I realized that there was an alternative to having a 9 to 5 job, it was something I wanted to strive for from then. Greatest racing memory: The first stage of the 2015 Vuelta a España, my first grand tour, was a really wild team time trial. It was just 5 kilometers long so it was more like a progloue and we were racing along a beachfront bike path so there was a lot of chaos at first. The technicality meant that there was a lot of strategy going into it, so to pull that off perfectly and take the win, plus go into the overall lead with the team, was a dream. Race I dream of winning: For sure one race that I always wanted to win was the US National Time Trial Championships and I’ve now done that two times in a row. It’s pretty cool to wear the stars and stripes skinsuit and it gives you a lot of recognition every time you put it on. Another goal is to win a stage from a breakaway at one of the grand tours. Every time a breakaway succeeds in a grand tour, people are rooting for it because it’s pretty rare. So to be the strongest in a group of guys that has been out at the front all day would be really special. If I wasn't a pro cyclist: I would want to be a builder. I’ve been really interested in carpentery and building since I was young and I started to learn when I was in high school. I’ve put it on hold for now but I haven’t lost interest in it so I would like to pick it up again after cycling. Joey Rosskopf is the two-time reigning U.S. national time trial champion. 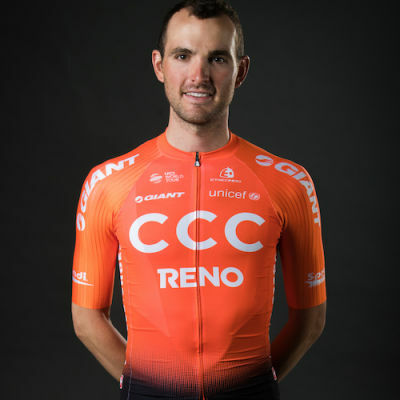 The American has also showed his time trialing prowess at both the Giro d’Italia and the Vuelta a España with a top-5 finish on the final stage of the Italian grand tour in 2017 and strong second place on a TT stage at the Vuelta in 2018. Rosskopp is often pushing the pedals in support of his teammates, but in 2016 he showed he has what it takes to win when he took the opening stage of the Tour du Limousin and held on to take the overall victory at the four-day stage race.